Dayton Daze theme this year is Fired up for the Fifties. 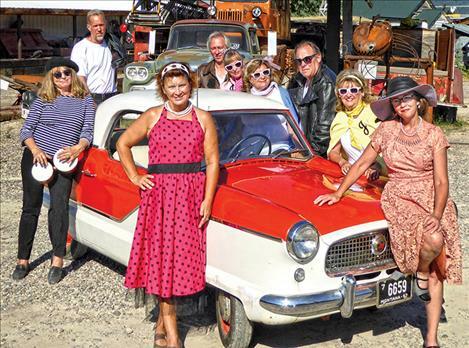 Events start at 10 a.m. with a car show, flea market and live music. DAYTON – The Chief Cliff VFD/QRU is Fired Up for the Fifties. While other volunteer fire departments are struggling to keep members and continue to grow, the Chief Cliff VFD/QRU is on fire. This year Chief Cliff is raising money for three items: a thermal imager (to detect hot spots within structures, identify heat sources in smoky conditions, and locate bodies that may be thrown from vehicles at night); a vital signs monitor (to assist EMTs in monitoring patients while performing life-saving procedures); and enhanced communications equipment (including new radios and/or paging equipment). While these items are standard equipment for most departments, the Chief Cliff fire service area relies on a mere $100 per taxpaying household for its funding, which means it is vastly underfunded. For that reason, Dayton Daze, the annual fundraiser, is an important source of income for the department. The theme of this year’s costume event is Fired Up for the Fifties, and attendees are encouraged to dress for the occasion. Whether you draw your costume inspiration from Happy Days, Breakfast at Tiffany’s, Leave it to Beaver or Gunsmoke, the Dayton Park is the place to be—and you just might win a prize for best costume. Events start at 10 a.m. with a car show and flea market, followed by live music with Larry Myer, face-painting, kids’ games, firefighter competitions, ALERT helicopter landing, and more. The VFD will be selling root beer floats, frozen treats, and beer, and will offer free hot dogs from 12 – 2 p.m. The parade will begin at 2 p.m. this year (with prizes for best entries), and the rifle raffle (for a lever action Henry Big Boy .44 mag carbine), silent auction, 50/50, and other activities will continue throughout the afternoon with the main drawing at 5 p.m.
Dayton Daze is a community-wide event with brunch and baked goods at the Dayton Church, free wine-tasting at the Mission Mountain Winery, and “free” sailboat rides (for a modest donation) at the Dayton Yacht Harbor. Once again you can hop a shuttle from the Dayton Park to Proctor where two historic landmarks—the old Proctor Store and the Proctor Church—will be open for tours. Dayton Daze is the costume event of the season, and it grows bigger and better each year. Don’t miss your chance to travel back to the fifties for an afternoon of fun and games, yummy treats, all-day prize drawings, and a parade like no other—and all for a great cause. For more information, check out our Facebook page (Dayton Daze) or call Zoe at 849-5917.